My name is Anna Paola Maestrini, but everybody calls me Panna. I live and work in the center of Italy, near Perugia and Assisi (Umbria). After a University degree in languages in Brussels, Belgium, I graduated at the Fine Arts Academy of Perugia, specializing in painting. Life led me to become a Qigong teacher, after a serious accident, from which I completely recovered. The missing link between body/energy work, intuitive creativity and spirituality was revealed to me by Dana Lynne Andersen, Director of the Awakening Arts Academy. Dana’s Academy is located both in the United States (Portland, Oregon) and in Italy, in Assisi, where I got a Certificate in Transformative Arts. What I love is sharing Creativity, Qigong and Art & Nature explorations as tools to become a conduit of true embodied Inspiration. Life has taught me to trust the infinite Intelligence of our Body and Soul to walk on the heart-opening Way back to the Source of all Love and Beauty. It is possible to expand inwardly into our Soul, and in the meantime ground our newly rediscovered Self deeply into our everyday life. 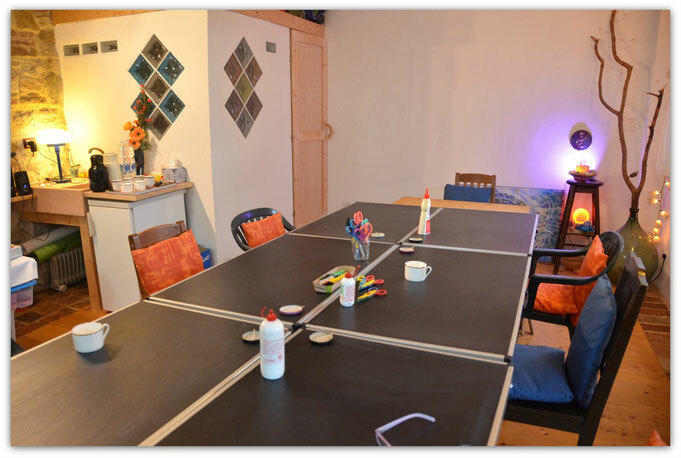 I love sharing what I call SPARKS OF WONDER by hosting guests in my studio and house, as well as in lovely venues very close to where I live, and offering a variety of individual and group workshops that blend many forms of intuitive, inspired art and conscious, gentle bodywork. 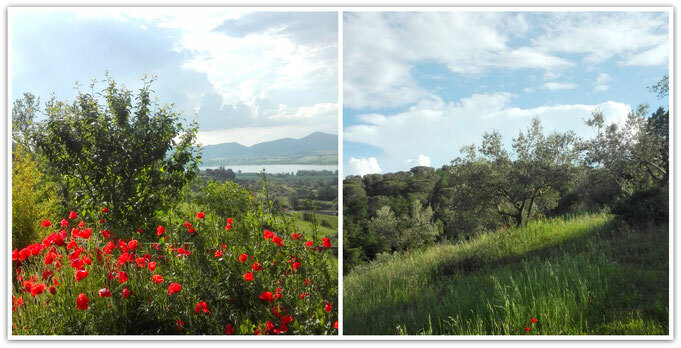 The wonderful nature that surrounds my house and the many treasures of art enshrined in the center of Italy – I’m close to Tuscany! – are the wonderful corollary of a very inspiring, life-changing experience for art & nature lovers who want to unite Creativity and Self-Discovery. Here are a few pictures to give you a taste of my Sparks of Wonder! Sparks of Wonder Studio ready for Creativity! Sparks of Wonder hosts a group...amazing souls creating side by side! A view of the house and studio - on the right. The landscape that surrounds the studio and house. I love working with all kind of people, male and female, children and adolescents, young, adult and elderly. My workshops are open to everybody. 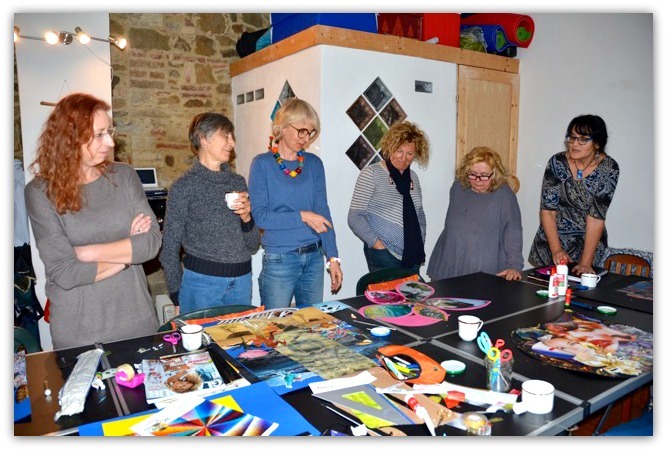 In the last few years, life has brought me to create a community of women who live in Umbria. 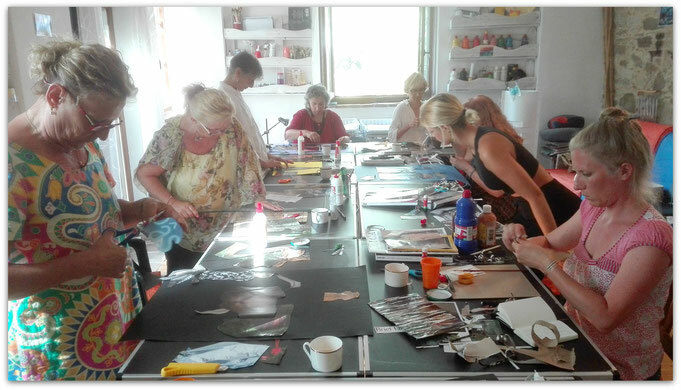 Their age goes from 30 to 65, they come from different backgrounds and countries (Italy, Germany, Australia, Switzerland, France…); we meet regularly in my studio to explore our wondrous Souls through Creativity. My Sparks of Wonder Program actually grew for and with them: their luminous spirits were the fertile ground that gave birth to all the workshops I now offer to a vaster public. I really feel at ease with every kind of person – I also enjoyed creating with autistic children and adults. But I consider sharing creativity with women a special gift from life. I love seeing their soul unfold and blossom through Creativity, and I am deeply moved every time their heart melts and opens wide to their innate Beauty. 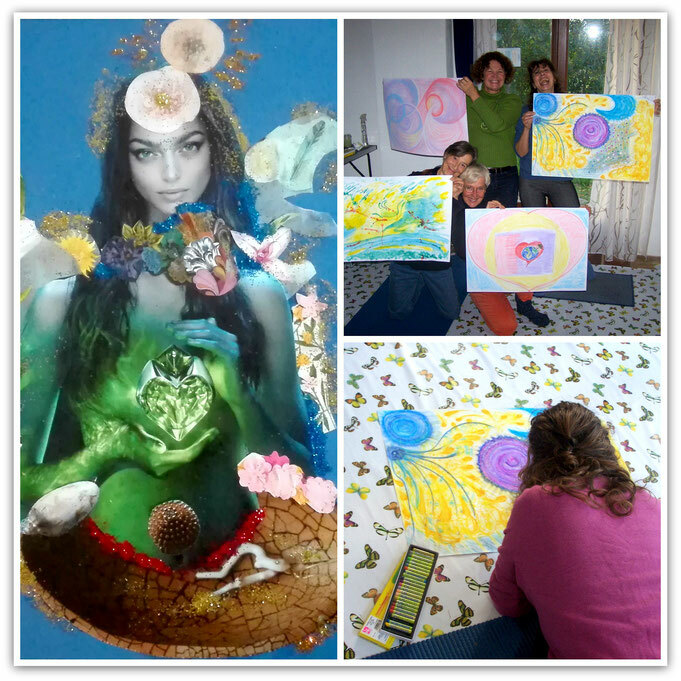 They all teach me that creativity is the birthright of every human being – you don’t need to be an “artist” to enjoy creating and unveiling the hidden treasures of your Soul! 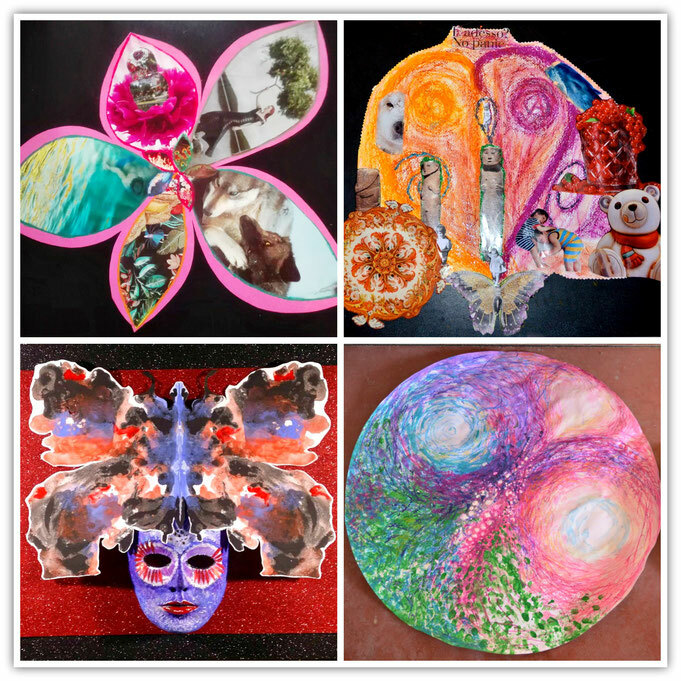 Examples of participants work in the Sparks of Wonder Program. 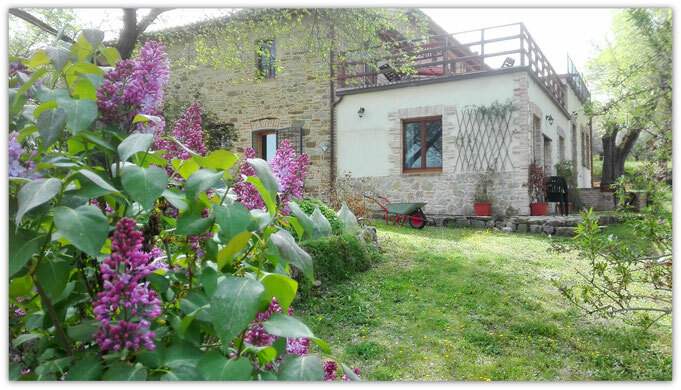 My studio has three large windows and a glass door opening onto the garden, surrounded by breathtaking views over the hilly landscape of Umbria. When the weather allows it, we all enjoy creating outdoors. It is as if we were creating inside a painting by Perugino or Piero della Francesca! I usually start every Creative Encounter with a specific “declaration of intent", by means of a brief and colorful Power Point presentation. I use many gifs and other animations (I love creating a sort of augmented, poetic reality), and a few words that are more evocative than explanatory. The initial invitation always includes some guided meditation, either sitting or accompanied by gentle movements. This is a lovely way to softly by-pass the chattering mind and enter the Intelligence of the Soul through our resilient Body. We use anything that may contribute to creating a Soul-Image, i.e. a collage, or a painting, or an object that speaks FROM and TO our Soul in the most perfectly synchronistic way. Glowing souls sharing their journey. When I creatively play with other people, I naturally keep tuned to a vaster space, wise and luminous, which does not come FROM me, but THROUGH me. This mysterious space, purveyor of unexpected and surprising insights, has become my true home, thanks to Qigong and meditation and to the many fabulous teachers and students I had the chance to meet in my life. I tend to the common creative space with the intention of creating a non-judgmental, protected, cocoon-like space full of love and genuine wonder. This is the kind of atmosphere I like to be immersed in myself, so why offer less than that! This is the sacred space, in which every Soul can be honored, in total respect of each person’s rhythms and possibilities. Sometimes challenging emotions may arise, but my experience is that the gentle field of energy created by all participants is always able to contain whatever arises; it is as if “personal” contents were compassionately held in a vaster “transpersonal” vessel. I like seeing myself as a Guardian of Creativity, during the Sparks of Wonder Workshops. Watching over the creative process is more something that I let happen, rather than really “doing” something. It requires openness, receptivity and listening to and from each participant. And the willingness to be happy. It is also contagious, and according to my experience, it soon extends to each person, who lovingly watches over oneself and the others, empathetically careful about one’s own and other people’s happiness. Empathy and deep listening are by-products of authentic creativity. One of the directives I never miss in my workshops is the importance of the HOW versus the WHAT. I always re-direct all participants back to the creative process itself, because the result – the final work – is not our main focus. I keep reminding my groups that we are training our “soul’s muscles”, and that all we create with our hands, trusting the infinite intelligence and wisdom of our body, is actually a tool, which helps us to RECONNECT with our true essence, with the deep intimacy of our own heart. This is why I use many different “tricks” to help bypassing the chattering mind and venturing into the Soul. For example, I may invite every participant to share their final work through a dance, or a distilled gesture that expresses the deepest insight they got from the whole process. Of course, I also love letting everybody share their journey with words, but even then I invite them to speak more about what they feel, or simply celebrate some discovery they made, not so much to go back to their mind through some interpretation. By the way, even if we don’t focus on the result, the final work is always beautiful, because of its natural richness in intimate discoveries and meaningful insights. 6. 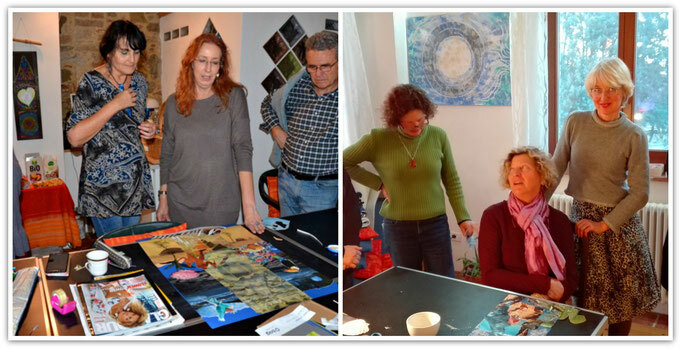 What most touches you about the art groups that you facilitate? As mentioned before, I am deeply touched when I witness the blossoming of a human Soul; Creativity is such a powerful vehicle to help even the most frightened or grieving hearts to gently open again. The more I trust the creative process and the innate bodily intelligence we all share, the more I see a fundamental trust in life arise and take root in every participant, as in myself. Our contemporary world is often the arena of separation and incommunicability; a group of people playing together with Creativity and freely expressing themselves is the best antidote! And I love seeing how the resulting empowerment and trust naturally overflow into many aspects of our everyday life. I can’t ask for more! I have many stories about great shifts and healings. One of my favorite is the story of a woman who came to one of my groups rather exhausted, after a long quarrel with her brother. She even had to resort to a lawyer and to spend a huge amount of money to solve their disagreement. Therefore, she was full of resentment and anger, plus the sadness and delusion of feeling betrayed by a close family member. Because of her burning anger, she had lost contact with her joy, her softness; everything seemed poisoned by her painful relationship with her brother. 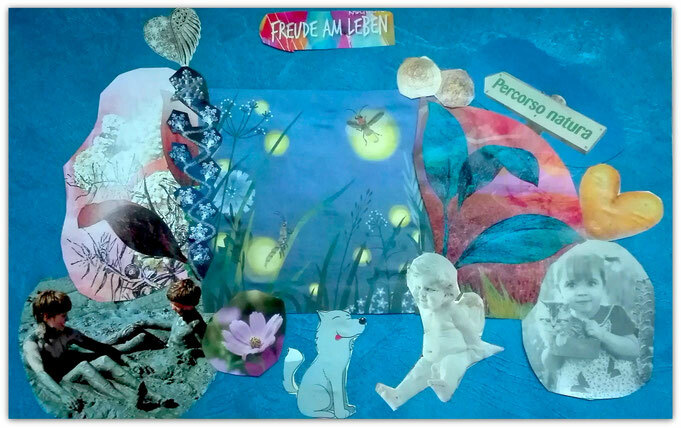 Right from her first collage, though, she kept choosing and gluing gorgeous, poetic, wondrous images. Her final works were always naturally full of glowing beauty, in total contrast with her ever-grouchy mood. She was even very self-ironic about this apparent contrast. Then, one day, she really had an epiphany. We were working with colors diluted with a lot of water; everyone danced and painted their own “drop of water”, which was a metaphor of something to let go. 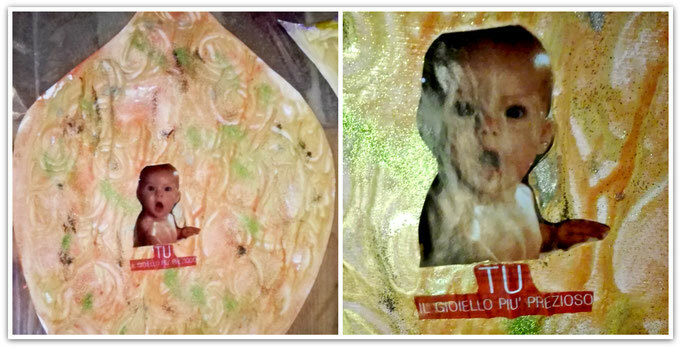 She made a golden drop and put a baby face in the middle, with some words underneath, saying: “YOU – the most precious jewel” (the original text is in Italian). As soon as she finished it, she melted into tears and told us she had remembered all the love she had shared with her younger brother when they were both kids. She had completely forgotten this feeling. She shared with the whole group the wonderful insight she was having about the importance of keeping alive her soft, tender, vulnerable and glowing baby heart in every moment. YOU - the most precious jewel. In my groups I often meet people who were led to believe they can’t draw, they can’t paint. The inner knot around traumatic events in our childhood can be very tight and painful, and seemingly impossible to unravel without creating more pain. This is even exacerbated by a messed up idea about art in general. I personally overcame this old fear by using collage, and this is what I offer to my most “fearful” participants, as a start on their creative journey. Then, slowly and gently, I add some other techniques, until everyone feels comfortable with freely expressing and enjoying whatever they do. Careless joy is a wonderful antidote against the inner critic! For example, I have had in one of my groups a 55 years old woman who told me: “I quit painting at the age of 14. The horse I painted then is the same I paint now.” Her first collage was almost a torture for her, as her inner critic was very alive and persuasive! She had her shift-moment while making her second collage, which brought her back to her early childhood, before some hasty and reckless adult declared she had no artistic talent at all. Underneath you can see her collage – the text says: Joy in Life and Nature’s Way, in German and Italian, respectively. She was even able to introduce much more creativity in her daily activity: she uses horses in pet-therapy programs for special kids. 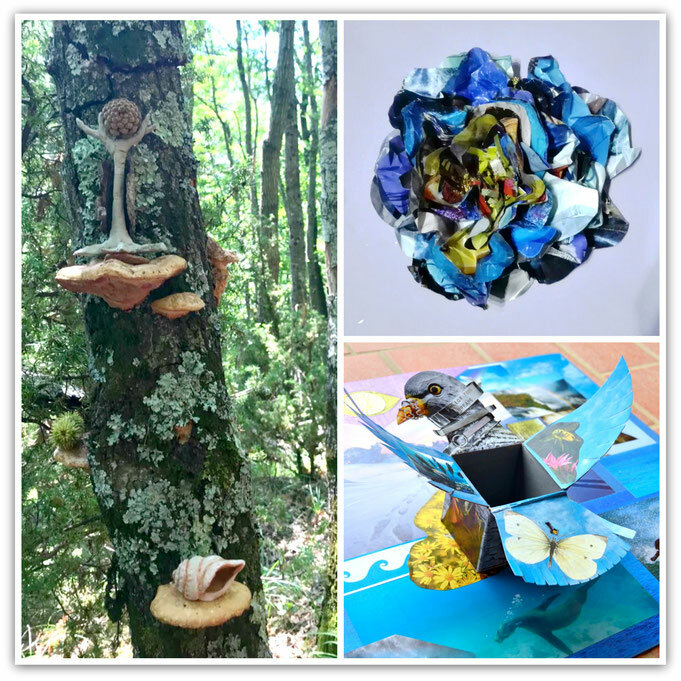 In her following collages, she deepened her innate connection with nature and children in a beautiful way. Since my early childhood, I’ve always loved sharing whatever I learned and discovered. I did it with my younger sister, with friends, with family. I couldn’t help it! I was born in love with life and I still am, despite all accidents, losses, traumas I had to cope with, like every human being. Obstacles were often my best teachers. Drawing and painting have always been my best companions: creativity has always been the best tool for me to put the puzzle back together when things were falling apart, and also when I had to celebrate a special moment of my existence. I just love people, I like their stories, their soul. Their uniqueness is always a source of wonder. I don’t really consider myself a teacher: I creatively play with the people coming to my groups, we make amazing discoveries together, we all learn from each other. 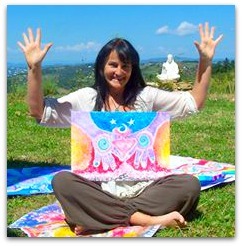 Creating alone and with other people is what makes me feel a joyous, centered and grounded person. It is what makes me human. Maybe what makes my art program unique is that life helped me design a special blend of expressive art, mindful bodily movements and guided meditations. My super bonus is the place where I live, in the heart of Italy: I love visiting museums, art exhibitions and breathtaking natural places with the people who join my Sparks of Wonder program! https://sparksofwonder.home.blog/ where you also find my email address. I’d love to welcome people from America and Canada in my Sparks of Wonder Studio… Let me walk with you into the uncharted territories of your Soul through Creativity! Let me also be your guide in the most gorgeous museums and places of art in the heart of Italy!